Greetings dear one, I Am Mother Earth or Gaia as I Am known by my soul name, as yes I Am a concious Being just as you are children and I Am aware of all the happenings upon and inside of my Earth. I Am coming forth with a series of small meditations that are easy to do and that have a very powerful effect. I will call this meditation series “4 Elements of The Mother” as I will bring forth these in a collective to help you work with my 4 main elements, Earth, Air, Water and Fire. I have brought to you Earth and Water already and today will be about Air. So take a seat if you can, if not it is best to return to this when you are able to be seated and relax. Although, once you raise your vibration to a certain extent you should be able to relax anywhere providing you are not in the middle of one of your physical tasks. As you sit, take a deep breath… connect with the breath as it moves though you and into your lungs, then exhale… feeling the release it provides. Build up a steady rhythm as you breathe in deep and exhale slowly. Now as you feel connected with my core see this connection expanding, growing as a beautiful pink light is now encompassing you and my body.. The Earth below you is now fully immersed in this beautiful pink light, sit with this.. feel this.. how do you feel? Notice and acknowledge the feelings that arise. See the Air Sylphs and Dragons flying and playing in this pure clean air, they may even have a message for you if you listen, take note to what you may see or hear. Once you feel you have done this enough and my air is pure and clean, see yourself drifting back into your body, bringing with you this beautiful pink light… Stretch your roots out of your feet and into my core, fully grounding yourself back into this reality. Thank you children, you are doing a great job at turning the Earth back into the paradise it once was and will be again. 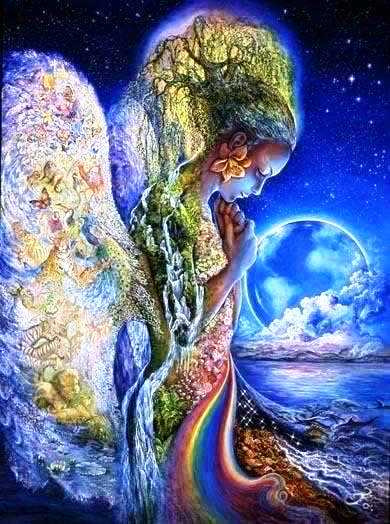 I Am Mother Earth and I love you all from the core of my Being to the Heavens and back.